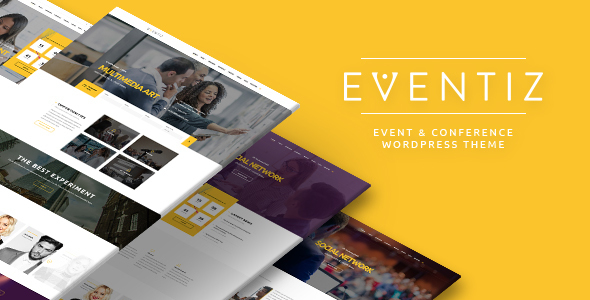 Eventiz is a dedicated WordPress theme for conference, meeting and event websites. The purpose oriented design, responsive layout and brilliant premade design concepts to represent content in smart way. Eventiz offers the complete feature package you would be looking for managing tickets, venues, speakers, sessions, sponsors and everything else required to succeed an event. This highly customizable theme lets you quickly start a stunning site for any kind of Event. The intuitive theme control panel and live theme editor allows you to customize the theme with ease based on predefined parameters (divided in groups). Eventiz is built with new web technologies and well optimized to maximize the speed. It supports lots of widgets to save you tons of time with content building. The theme comes with an extensive help file to help you understand how it works. Drop us a notice at: http://www.wpopal.com/questions/ if you encounter any problem or have questions, you will be supported by our best WordPress developers who will help you solve any problem within 24 hours.